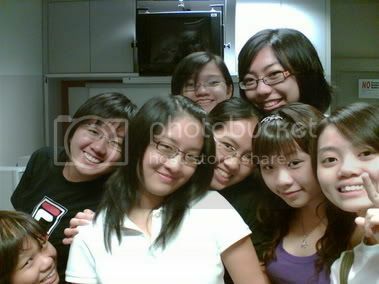 The Joy Of Being Tgt..
Thats the benefits of having a camera phone.. Hahaz.. And thats how my class behaves.. Whenever there is chance, pose!!! Hehez.. Dunno y i'm so lame.. I bought Hui Ting the star necklace yest, forgt to take a pic of tt chain alone, hehe, but nvm, she sae she likes it, but too ex at Tamp, so i went back Wdls to find.. Hahaz.. She treat mi so gd, these few daes pei mi take 969, so todae i surprised her with the necklace todae.. Hehez.. I gt Anna at bangle aso.. Hahaz.. So happy, but Anna aso always help mi pay for things de mahz.. Repay her.. Hehez.. Muackz.. I circle the necklace, scare too dark canot see.. See she so happy, i'm aso very happy.. Hahaz.. Muz treasure ah!! Hehez..
Tml gt tto presentation.. The other grps still deciding wth to wear the blazer anot, but i think our gers wearing half formal ba.. Hehez..